Regular maintenance is a necessity for exterior wood surfaces. Cleaning and ridding the surface of unwanted stains and contaminants such as dirt, mold, and mildew can help increase its longevity. A coat of water repellent sealer or deck stain can further help to enhance the beauty and increase the life of the wood. When a sealed deck begins to turn dark or collect mold and mildew it is a sure sign that maintenance is needed once again. 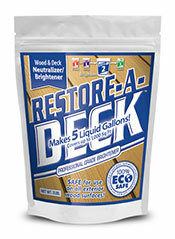 This is also true in the case of an old failing deck stain that is no longer performing as it should. In most cases, wood decks need attention about every 2-3 years depending on use and the surrounding climate. The easiest way to maintain a deck is to clean it and apply a maintenance coat of deck stain. 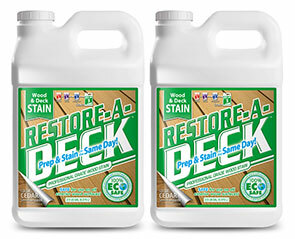 When a sealer is faded and worn pretty badly, the deck can be cleaned using Restore-A-Deck wood cleaner. This will remove all the contaminants and some of the old stain but not all of it. In most cases, if you are recoating the deck with the same or similar type of stain as previously used, it is not necessary to remove all the existing stain. 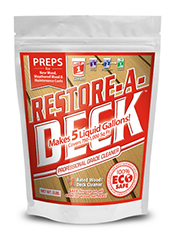 NOTE: This works best with semi-transparent oil based stains that have faded and may not work well with solid or water based deck stains that are peeling or flaking off. 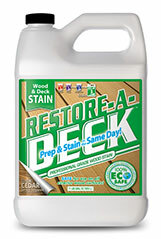 After cleaning the wood deck, apply the new stain using a pump sprayer, roller, or brush. Allow the stain to soak into the wood for several minutes before wiping any excess stain away with a stain rag or by back brushing drips and puddles. When a solid color stain or water based stain previously exists on a deck, it can actually start to peel or flake off as opposed to fading like an oil based stain. 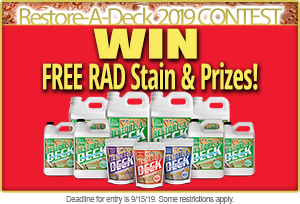 Most deck stains of this nature do not adhere well to one another, therefore it is best to remove all the existing stain prior to applying a maintenance coat of deck stain. 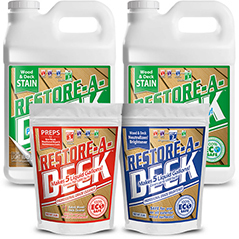 To remove a stain you need to use Restore-A-Deck Stain Stripper during the prepping process as opposed to the Restore-A-Deck Cleaner. Use a stiff brush or pressure washer to further aid in old stain removal. In extreme cases where a solid colored stain, acrylic based, silicone enhanced stain, or paint has been used, several applications of stain stripper may be necessary or it may be necessary to use a sander on any stubborn areas of existing stain that still remain once the wood has dried. The more old stain you remove the better the new maintenance coat of stain will perform. Regular cleaning and maintenance coats of deck stain will help block out harmful UV rays and prevent water damage which causes board warp, cracking, splitting, and wood rot. 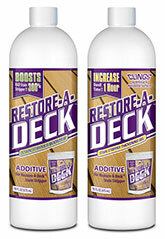 Stay on top of deck maintenance and your wood surfaces will look better and last longer. I used Restore-A-Deck cleaner on my untreated cedar trellis, which is 3 years old, and am quite happy with the results. If I use this product every summer, will I be able to avoid the accumulation of gray, or will it eventually take over if I don't stain or seal the wood? I'd prefer to just wash the trellis every year than deal with fading/peeling stain years down the road. Thanks for your reply. Depends in your Uv exposure. Once a year might be stretching it. It might be needed twice a year to keep the gray away. It will not beach it but it may clean it. Best to just rinse well when done the entire deck. 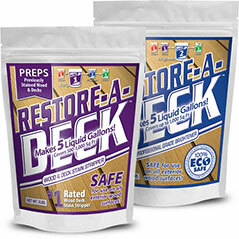 If I am cleaning with Restore-A-Deck Cleaner on part of my deck and some cleaner spills onto another area (newly stained semi- transparent oil base), do I need to re-stain that area? What all does the cleaner remove? No you should be okay. Will the RAD stripper remove ADM-2000 pigmented sealer (Pecan finish) from my cedar deck. The boards right next to the house are very dark due to excess water spilling over clogged gutters and the relative lack of sunshine.